Last Saturday was International Games Day @ Your Library and I was lucky enough to help organise the free event at The British Library. We were going for an Alice in Wonderland theme in general (although we had many games that weren’t themed around Alice), as the Alice exhibition at the library had only opened the day before – it was a good tie-in and gave us a focus. The event included a huge range of tabletop games provided by board game enthusiasts, and computer games from both the British Library/Game City Off The Map competition (including Gyre and Gimble’s game) , and games from Alice Jam 150. We had planned to run a couple of Pocket Code/Paint sessions to show people how to create Alice game art and a game in an hour and to tie in with this Pocket Code Alice game jam in December. In the end we only ran the Game Making with Pocket Code session (lack of attendees) with a couple of people. Even though it would have been nicer to have more people attend, I still enjoyed running it and I think those attending enjoyed it too. Everything else went down very well – we must have had 100+ people come along on the day and many stayed and played for a while. Having tabletop game enthusiasts who could show other volunteers and anyone who came along how to play the games was important. Having Gyre and Gimble there to talk about their game was great too, especially as they received such positive feedback about it. 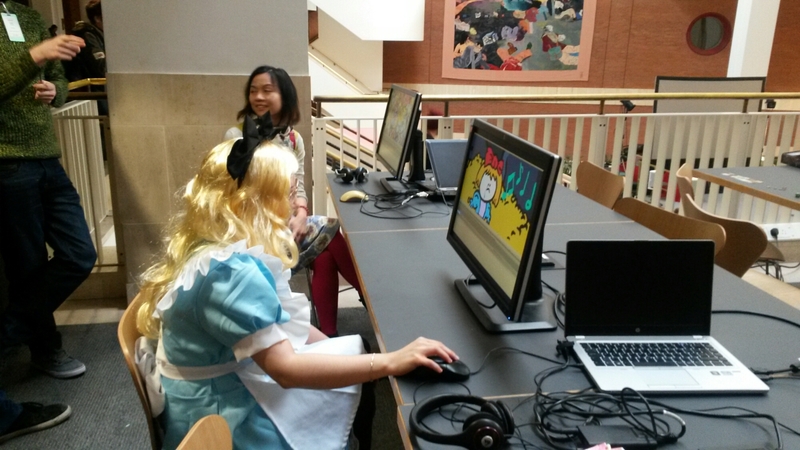 It was also fun to watch other people try out the Alice Jam 150 games – again, all of which got positive feedback. The most popular was Down the rabbit hole. 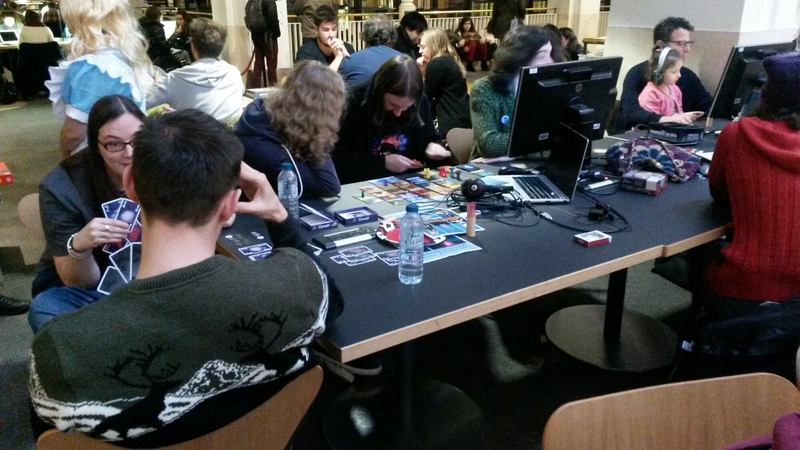 As well as the main event we also ran gaming sessions on Friday and Saturday evening as part of the Alice late event – again, the sessions were extremely popular and I’m sure we must have had at least another 100 participants across both nights too. 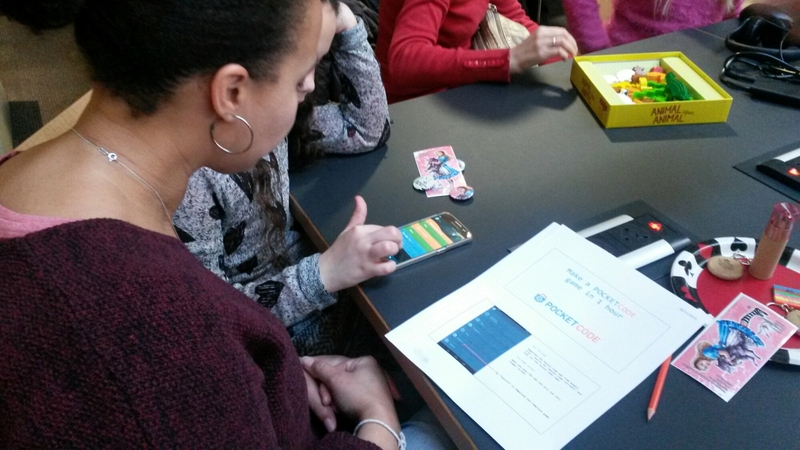 As well as having fun, it was a great learning experience for me in so many ways, and I had the chance to meet and talk to an interesting group of people helping out at the event – including sharing ideas about Pocket Code. It was yet another event that I came away from buzzing with ideas. Well done to Stella Wisdom as the main organiser who pulled it all together, and to everyone else who played a part in helping out. At the #CityMash event yesterday I ran a session about storytelling through digital games and interactive fiction. I’ve written about some of this in the past on the Read Watch Play blog, and I’ve wanted to explore the idea of how libraries could play a role in digital storytelling in this way for some time. Specifically I’m thinking about how libraries could run sessions to create stories in this way – sessions that could bring writers and game makers together. This is the presentation I gave. 4. Screenshot taken from text adventure ‘Colour of Magic’ by Delta 4. The game is played by entering text to direct progress of the story. For example, in this section, the player might type in “Go Hubward” or “Go Turnwise” to move to a new location in the game world. 5. ‘Spent’ is an interesting example of a game using a storytelling method to highlight issues around poverty. This type of game could be regarded as similar to the Human Library concept. It appears on the Games for Change site, which features games containing social awareness themes. 6. This is an example of a free tool called Quest, that anyone can download and use to create their own interactive fiction or text adventure games. The screenshot is taken from the game ‘Whitefield Academy of Witchcraft’. 10. Interactive Fiction Database – directory of published I.F. works, inc some based on: • J.R.R. Tolkien’s Middle Earth • Other book characters, including Sherlock Holmes, Alice in Wonderland, Hitch Hikers Guide to the Galaxy, Spider-Man • Film, TV and Radio tie-ins, including Dallas, Rambo and The Archers BBC radio programme • Star Wars • Jaws! 13. Fallen London http://fallenlondon.storynexus.com is set in a fictional London in what seems like a pseudo Victorian period. It combines text stories with visuals, interaction between players and users can also create their own stories using the StoryNexus software. 16. Ideas raised in discussion during the session • Text based games encourages development of literacy, reading, creation and creative writing skills. • How does it impact on digital literacy skills? • Games with varied characters & story backgrounds encourages understanding of diverse cultures & people. • There could be a good opportunity to develop collaborative physical game- making communities in libraries, with a focus on storytelling & games. • Sometimes text in games is skipped to get to the ‘fun stuff’, but those coming to a text based game knowing that it’s text based are happy to read. • It enables knowledge sharing – through the subject of the game (e.g. human library, Never alone etc.) & also knowledge of how to create games. • How can digital storytelling be connected to physical activities too? Maybe via creative Makerspace sessions? It was extremely useful to discuss ideas with those who attended my session, and the feedback I received about it was really positive and encouraging – so I’m very keen to try some of these ideas out soon. Edit: I’ve put together a Storify of the Twitter discussion about this #CityMash session. I gave the following presentation at the recent CILIP Cymru Wales 2015 Library & Information Conference. The abridged text of my presentation appears below the presentation itself. Hello my name is Gary Green & I am going to talk to you about a library advocacy project I have been involved with called The Library A to Z. This is a project that primarily myself and Andrew Walsh, a librarian at Huddersfield University, pulled together, but as the title suggests its success also depended on others being involved and supporting it in a variety of ways. What is the Library A to Z? The original idea came about because through my involvement with Voices for the Library in particular. I was constantly seeing these sort of questions. We all know why libraries are important, but there didn’t seem to be anything out there that highlighted the importance of libraries beyond the “libraries are just about books” idea. Yes, books are a core part of the service, but libraries provide access to many other things too. At Library Camp East (Sept 2013) I ran a session to crowd-source A to Z list of library services and benefits of libraries. About 20 people from different library backgrounds sat around for an hour and discussed it. Then I wrote it up, posted it on the Voices for the Library site and encouraged library supporters to make us of it. But I also wanted to turn it into something more than a list of words. I attended Library Camp (Autumn 2013) & Andy Walsh was there – I talked to Andy about doing something creative with the list & the idea of a book came up. So the idea was there but we didn’t really discuss it again until March/April the next year. Then we had the next stage, the Kickstarter (April/May 2014). Andy came up with the idea of a Kickstarter project to fund the production of illustrations and materials related to the A to Z. 155 people and organisations (mostly individuals) raised £4,500+ to fund the project, inc. £1,500 from our key sponsor the Library Campaign. It was launched in Nov 2014 – i.e. the physical materials were made freely available to anyone. I’d like to talk about the Kickstarter now, as this was a key part of making things a success. A Kickstarter is a way to get your project funded quickly by anyone who feels the project is worthy enough. Take a look at Kickstarter.com for details. All you need to do is set up a page on the site providing details of your project. It took effort to sustain the fundraising drive – we couldn’t just send out 1 tweet & email a library discussion list once and expect it to be a success & be funded instantly. There were lots of mentions by other people on mailing lists, social media sites and I know emails were being sent around behind the scenes to likely backers. We had 155 backers – many were individuals backing the project. We also had some organisations, including our key sponsor Library Campaign, who really helped us meet our stretch goals. Our minimum goal was to raise £2,000 in 4 weeks, but we raised just over £4,500 in that time. The £4,500 funded the production of physical materials for distribution, which all focused around a set of full colour illustrations by Josh Filhol. All the illustrations in the presentation are by Josh. We distributed packs to key stakeholders mostly in the UK, but also contacted international library organisations (IFLA) and E.U. politicians with an interest in libraries. As well as backers based in the UK we also had backers from Europe, Australia & North America. How did we organise the project? This example is taken from the book. Each double page spread in the book included the words for each letter, plus a quote related to that word taken from blog posts on the Voices for the Library site, plus a full page illustration. The idea for the quotes was to get the words of real life users/library staff to get the message across about how libraries can make an impact on an individuals life. The book also included a chapter on the value of libraries, which includes facts/figures, links to impact studies, etc. When we launched a lot of supporters got behind us and helped. Supporters included many library & information workers & advocates for libraries, library & information students, Arts Council England, library campaigners inc Library Campaign. The launch focused on both a social media/mailing list push and the sending out of physical materials. During the launch week packs, including the books & cards, were sent out to over 100 key influencers inc politicians at national level (UK MPs, party leaders, & shadow ministers, House of Lords representatives, library committee members). The aim was to remind them that libraries still do exist and have so much to offer. Ultimately the aim is to encourage continued support and investment in library services. We also sent packs to around 30 media organisations. The intention was to spread the positive Library A to Z message that libraries continue to remain relevant. During launch week we used the hashtag #LibraryAtoZ on Twitter and had 1,000+ mentions and retweets on Twitterand over 20 blogs and news sites mentioning it. Speak Up For libraries held a conference on the last day of the launch and we were able to gave free Library A to Z materials out to those who attended, including politicians from major parties attending. What free materials are available? Book (print and e-book) – inc all illustrations and words, and relevant quotes from Voices for the Library site. Posters – editable Adobe Illustrator files and sample PDF files. The posters are intended to be most effective when edited and details of local library services, events etc. are added to them. Unless otherwise stated, these materials can be downloaded and freely re-used under a creative commons licence (cc by 4.0), so please re-use, adapt and take full advantage of them, as long as you credit the original creators. The original aim of the project was to fund the creation of the materials and send out materials to promote and advocate for libraries, which we have achieved. However, the original materials were also created so that other people could adapt and re-use them in new ways. They are a free resource for others to build on. So that was the Library A to Z, how it came about, and what’s available. Here’s the website address again (http://libraryatoz.org) where all of the materials can be downloaded from. Thank you for listening – on behalf of myself, Andy Walsh & everyone who has been involved in the Library A to Z along the way.